Orphan Black S02E06, Sarah and Helena arrive at a church where Ethan has been. Sarah visits the archives to learn more about Ethan, and with the aid of Art and Felix investigating the files from Maggie’s locker, learns that he changed his name to Andrew Peckham. Rachel has Paul replace Daniel as her monitor and lover, while also withholding a stem cell treatment from Cosima. 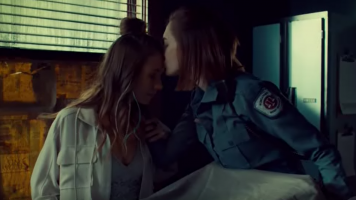 Despite this, Leekie plans to treat Cosima anyway. Cal and Sarah hide the car and the assumed-dead Daniel. Sarah leaves Kira with Cal and returns to Mrs. S’s home with Felix, where they find news clippings of Susan and Ethan Duncan, the founders of Leda and the cloning project and Rachel’s adoptive parents. Frida is a 2002 American biopic drama film which depicts the professional and private life of the surrealist Mexican painter Frida Kahlo. The Third Wife 2019, as the name, is about the life of the youngest bridal of a family. And her lesbian relationship with the second wife. HEADLONG // This intimate glimpse at two teenage girls in a Moscow locker room is a simple but rich exploration of burgeoning sexuality and a search for expression and feeling. An ode to resisting conformity and finding your own way, particularly resonant given the setting is a cavernous post-Soviet swimming pool. Directed by Nadia Bedzhanova. You are harrassed if you are hetesexual, like the way homosexual is harrassed today. This short film has a message like that. So if you want to harrass someone, just think of the way they do the same to you and you will see.